I recently got a new sewing desk that we placed in the guest room. I had been sharing my husbands desk before but it just didn't work that well. So once I got a new desk well that meant I needed a new chair....er....or 2. I hit up one of my favorite thrift/junk stores, and found both of these beauties. I would call that a jack pot trip. The one on the right matches perfectly for the colors in our guest room and I got it for 20$. It was a part of a set, but the set had 5 chairs so she sold me one...WINNING!. Okay sorry couldn't help myself. The other one was buiried under some hideous rug, I uncovered it and thought umm...yes I will take you too for only $20 more dollars!!! SCORE people major score. Oh I just love that pretty blue chair! What a great find that was! I have a thing for chairs! Drives my husband batty 'cause I some are still in need of "refinishing". These are fabulous! 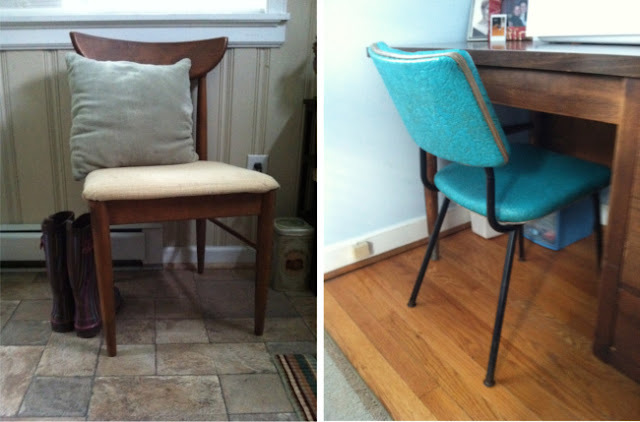 I especially love that teak looking mid century modern chair. I hope you're enjoying the holiday season. I finally started wrapping presents last night and I'm still not done.